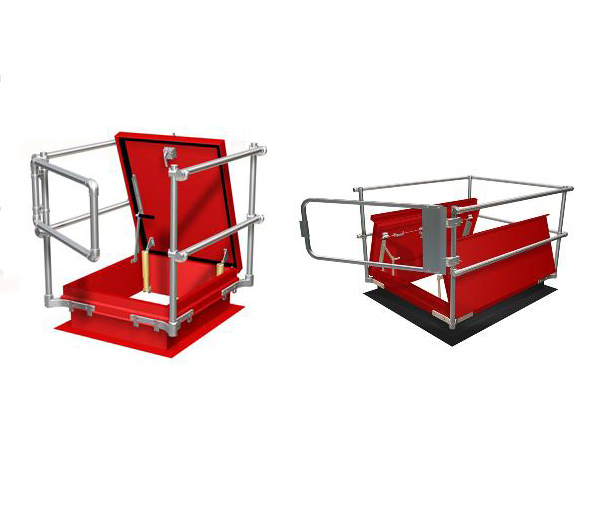 The KeeHatch® Safety Railing System is designed for safe egress and ingress through roof access hatches and for protection of the roof opening while the roof hatch is open. The railing system meets OSHA Standards 29 CFR 1910.23 and 29 CFR 1910.27. OSHA 29 CFR 1910.23 requires that the exposed sides of openings in roofs or floors have some form of guardrail protection. When the hinged cover for an opening is left up, the exposed sides must be appropriately protected. KeeHatch® is comprised of Kee Klamp® fittings which are supplied in a corrosion resistant galvanized finish and now also available in Kee Lite® aluminium . Seven different models plus custom sizes are available to suit any situation. KeeHatch® Railing Systems are able to integrate with existing roof openings and ladderways. All fittings are galvanized to ASTM A153, and all 11/4' Schedule 40 pipe is galvanized to ASTM A53. Aluminum, not plastic or FRP, will not break or deteriorate from UV. Only a few components for 20 minute installation by one person. Fastclip™ connection at base makes installation quick & easy. 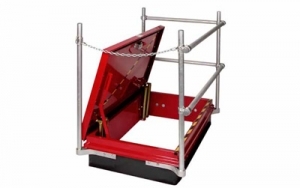 Exact fit for Bilco, Babcock Davis & Nystrom RailingReady® roof hatches and all others. Part of the KeeHatch® family of products, the Floor Hatch Safety Railing is designed for safe egress and ingress through access hatches and for fall protection for the floor opening while the access door is up. The railing system uses the industry leading Kee Klamp fittings and is easy to assemble. The Floor Hatch Safety Railing kits are made with either galvanized 11/4' pipe or aluminum 11/2" pipe for all hatch sizes. Installation is easy. For a standard installation, drill 2 holes for each base fitting (Type 62) and use lag bolts size 3/8' x 21/2' and lag shields to fix railing bases in place (lag kits sold separately). If the system is required to be removable, use ground socket fittings (Type 66) that are installed flush with concrete. All set screws should be tightened to 29 lbs/ft during installation. A 2 sided kit can be ordered if the floor hatch backs to the wall. 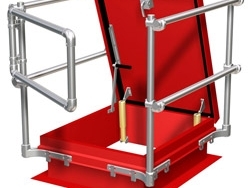 The Floor Hatch Safety Railing can also be custom designed accommodate a toeboard if needed.